Publicerad 2012-11-24 19:21:00 i Balochistan. 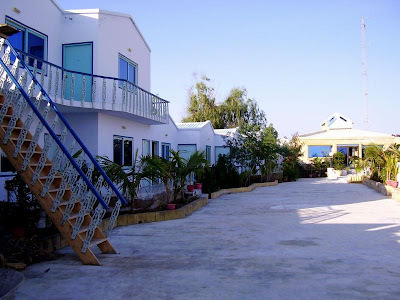 Gwadar is located on the south-western coast of Pakistan, on the Arabian Sea. It is strategically located between three increasingly important regions: the oil-rich Middle East, heavily populated South Asia and the economically emerging and resource-laden region of Central Asia. The Gwadar Port is expected to generate billions of dollars in revenues and create at least two million jobs. In 2007, the government of Pakistan handed over port operations to PSA Singapore for 25 years, and gave it the status of a Tax Free Port for the following 40 years. The main investors in the project are Pakistani Government and People's Republic of China. 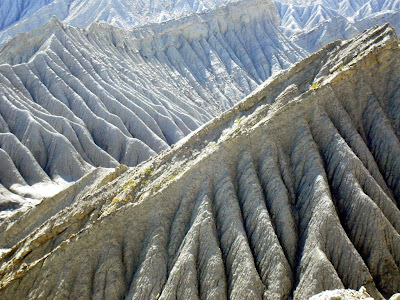 The Makran region surrounding Gwadar was occupied by an ancient Bronze age people which settled in the few oases. It later became the Gedrosia region of the Achaemenid Persian empire. It is believed to have been conquered by the founder of the Persian empire, Cyrus the Great. The capital of the satrapy of Gedrosia was Pura, which is thought to have been located near the modern Bampûr, in Iran. During the homeward march of Alexander the Great, his admiral, Nearchus, led a fleet along the modern-day Makran coast and recorded that the area was dry, mountainous, and inhabited by the Ichthyophagoi (or "fish eaters"), a Greek rendering of the ancient Persian phrase "Mahi khoran" (which has itself become the modern word "Makran"). After the collapse of Alexander's empire the area was ruled by Seleucus Nicator, one of Alexander’s generals. The region then came under "local rule" around about 303 BC. The region remained on the sidelines of history for a millennium, until the Arab-Muslim army of Muhammad bin Qasim captured the town of Gwadar in 711 CE and over the intervening (and nearly equivalent) amount of time the area was contested by various powers, including the Mughals (from the east) and the Safavids (from the west). The Portuguese captured, sacked and burnt Gwadar in 1581 and this was then followed by almost two centuries of local rule by the various Balochi tribes. The city was visited by Ottoman Admiral Sidi Ali Reis in 1550s and mentioned in his book Mirat ul Memalik (The Mirror of Countries), 1557 CE. According to Sidi Ali Reis, the inhabitants of Gwadar were Baloch and their chief was Malik Jelaleddin, son of Malik Dinar. In 1783, the Khan of Kalat granted suzerainty over Gwadar to Taimur Sultan, the defeated ruler of Muscat. When the Sultan subsequently retook Muscat, he was to continue his rule in Gwadar by appointing a Wali (or "governor"). This Wali was then ordered to subjugate the nearby coastal town of Chah Bahar (in modern-day Iran). The Gwadar fort was built during Omani rule, whilst telegraph lines were later extended into the town courtesy of the British. In 1947 Pakistan gained her independence from Britain and in 1958, the Gwadar enclave was transferred by Oman to Pakistan. It was then made part of the Balochistan province In 2002, the Gwadar Port project (of building a large, deep-sea port) was begun in the town. The government of Pakistan intends to develop the entire area in order to provide much needed employment to the local population . In addition to expanding port facilities, the Project aims to build industrial complexes in the area and to connect the town via a modern highway to the rest of Pakistan. 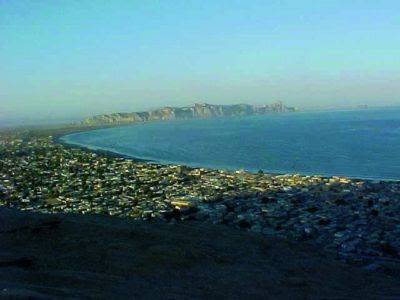 Gwadar's location and history have given it a unique blend of cultures. The Arabic influence upon Gwadar is strong as a consequence of the Omani era and the close proximity of other Arab-majority regions. The legacy of the Omani slave trade is observed in the population by the presence of residents which can trace their descent from the African slaves who were trafficked through the town. The area also has a remarkable religious diversity, being home to not only Sunni Muslims, but also to groups of Christians, Hindus, Parsis, and various minorities such as the Ahmadies. 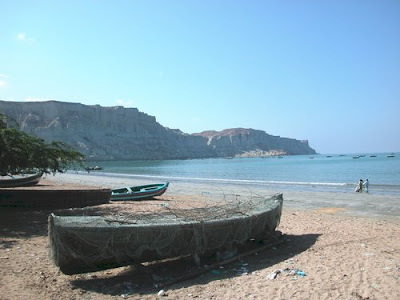 Gwadar is located on the Gulf of Oman close to the entrance of the Persian Gulf, about 460 kilometres west of Karachi. In 1993, Pakistan started feasibility studies for the development of a major deepwater seaport at Gwadar. The port project commenced on 22 March 2002 with the first phase completed in December 2005. The construction of the port has spurred other major infrastructure projects in the area. This includes the 700 km Makran Coastal Highway which is now complete. The road links Karachi with several ports along the coast including Ormara, Pasni, Gwadar and will be extended to the Iranian border in the future. The highway has reduced travel time to Karachi from 48 hours to only 7 hours. 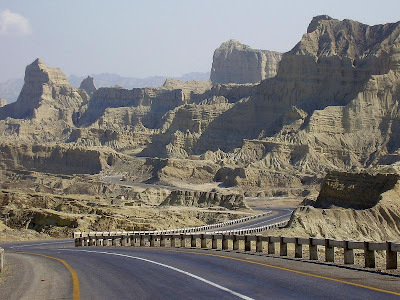 Other road projects include the Gwadar-Quetta-Chaman road which is due for completion in 2006 and a roadlink to the town of Khuzdar in eastern Balochistan. There are also plans for a terminal for passenger ships. The Civil Aviation Authority of Pakistan has earmarked 3000 acres (12 km²) of land for Gwadar International Airport which will be built 26 km away to the northeast of the existing airport towards Pasni and is likely to cost between $200-250 million. The new airport will be given international status and operate under the open sky policy. In the meantime there are plans to improve facilities at the existing airport. The government is focusing on laying the Havelian-Kashghar (China) and Quetta-Kandahar (Afghanistan) railway tracks . In 2006, Ministry of Railways announced that Gwadar will be connected to Pakistan Railways network at an expected cost of $ 1.25 billion (Rs. 75-billion). Gwadar deep-sea port emerges as a place of great strategic value, enhancing Pakistan's importance in the whole region, extending from the Persian Gulf through the Indian Ocean to Southeast Asia and the Far East. The construction of the Gwadar deep-sea port is just one component of a larger development plan which includes building a network of roads connecting Gwadar with the rest of Pakistan, such as the Gwadar-Turbat road (188 km). 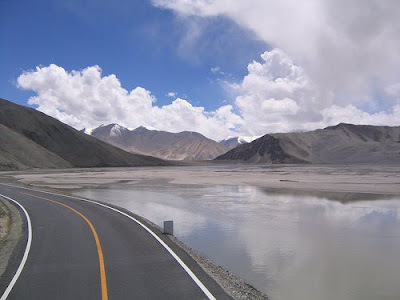 This network of roads connects with China through the Indus Highway. Pakistan, China, Kazakhistan, Kyrgizstan and Uzbekistan are developing extensive road and rail links from Central Asia and the Chinese province of Xinjiang to the Arabian Sea coast. The Pakistani Government has initiated several projects, with majority financial and technical assistance from China, to develop Gwadar's strategic location as a goods transit and trade point. The primary project is the construction of a deep-sea port at Gwadar to enable high-volume cargo movement to and from the landlocked Central Asian states. The new port will also encompass conversion facilities to allow for the movement of natural gas as a part of plans for a termination point for the Turkmenistan-Afghanistan-Pakistan natural gas pipeline. The significance of Gwadar is great to both Pakistan and China. China is going to be the beneficiary of Gwadar's most accessible international trade routes to the Central Asian republics and Xinjiang. By extending its East-West Railway from the Chinese border city of Kashi to Peshawar in Pakistan's northwest, Beijing can receive cargo to and from Gwadar along the shortest route, from Karachi to Peshawar. 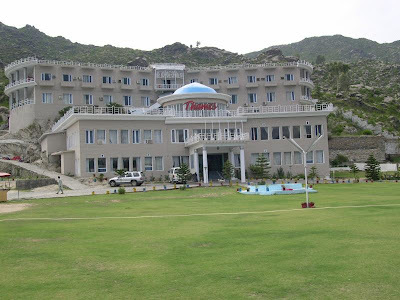 Oman has offered $100 million aid for the development of social and infrastructure facilities in Balochistan. Out of $100 million, Oman has provided $7 million for extending of runway at Gwadar Airport, construction of jetties, upgradation of Gwadar Hospital, provision of 100 engines to fishermen and construction of power house. Oman is also financing construction of Gwadar-Hoshab Road, water supply scheme in Gwadar area and construction of irrigation dams. Pakistan and Oman have signed a number of agreements including Avoidance of Double Taxation, Promotion and Protection of Investment, Cultural, Technical and Educational Cooperation, Agreement on cooperation between Oman Chamber of Commerce and Industry and FPCCI, Maritime Boundary Agreement and Agreement to establish Pak-Oman Joint Investment Company. The proximity of Oman is an asset to Pakistan. Around 70,000 Pakistani citizens are participating in the development of Oman. Omani assistance for construction of Gwadar Port would go a long way in promoting economic relations between Pakistan and central Asian states. A number of electric power generation projects are also being carried out in Gwadar and in its surroundings. The Quetta Electric Supply Company (QESCO), a subsidiary of the Wapda, has geared up the work for building the power transmission line. It is expected to be completed soon. There is a need for the expansion of the airport and enlargement of its runway to facilitate the landing of wide body aero-planes. There are other economic and political dimensions to this issue as well: I am using here some research done by Owais Mughal of Pakistaniat.com which goes in some detail to establish how important Gwadar is for Pakistan and the threat this project is causing in Iran and India. “Pakistan inaugurated its third deep sea port in Gwadar in March 2005. It became operational in March 2008 when first the ship carrying 52000 tonnes of wheat from Canada berthed here. In my opinion a great news of development for Pakistan, especially as a project whose foundation stone was laid just three years ago on March 22, 2002 and its first phase got finished on time in March 2005. Phase I includes building of three multipurpose berths. Gwadar port operations are run by the Port of Singapore Authority (PSA) under a 40-year agreement. In my opinion this is a brilliantly planned project and a great strategic move by Pakistan. With Pakistan Motorway Project connecting Gwadar to Peshawar via Punjab, a World Class Coastal Highway (N10) connecting Gwadar to Karachi, it may very well become the trade hub for this century. But while Pakistan has played its best move, other regional and global powers are also not sitting silent and they are making their own moves making Gwadar port a project with multi-dimensonal consequences. (1) Gwadar is located only 180 nautical miles from the Strait of Hormuz through which 40% of World’s Oil passes. Gwadar could thus emerge as the key shipping hub in the area providing mass trade to central asian republics as well as across Pakistan and China. A road from Gwadar to Saindak is completed. Saindak is already connected to the RCD Highway (N35) and through Quetta-Chaman it provides the shortest route for trade with Central Asian Republics. (2) Pakistan also needed a deep sea port away from Karachi so that in times of hostilities Pakistan Navy doesn’t get blockaded. With all the navy ships concentrated at Karachi port, a blockade of Pakistan had been quite easy in the past. With Jinnah Naval Base at Ormara and Gwadar port, PN should be able to spread out its assets. For reference, Gwadar port is 450 km further away from Indian Border than Karachi Port. (3) Gwadar port will directly and indirectly bring lots of wealth, trade and infrastructure advancement to the area which has been traditionally left behind in developement. Compare it to how Karachi port transformed a once sleepy fishing village to a megapolis. (1) It is also widely claimed that there is a Chinese interest in reaching the blue waters of Arabian Sea. This is cited as a strategic move by Chinese as they funded US $198 million (out of total phase I cost of US $248 million) and also provided 450 Engineers on site to finish the project on time. It is said that China is trying to develop its Western regions at par with its Eastern regions to reduce the economic gap within China and to stop the internal migration of people from West to East. It is famously called their ‘Go West’ policy. To market products produced in Western China, ports of Shanghai or other eastern ports are almost 3000 km away from the western production centers where as Gwadar provides access to a port at just 1500 km. (2) There is another dimension to this project where Gwadar port is considered as the naval outpost for the Chinese. It has been called part of ‘String of Pearls’ strategy of Chinese where they’ve got hold of strategic ports in Gwadar, Bangladesh, SriLanka, Burma, Thailand, Combodia, and South China Sea etc. On a world map, these ports form of string (of pearls) which may form as Chinese line of defense to control oil movement. 80% of oil used in China goes through shipping lines of Malacca Straits. This strategy of a series of ports along the oil shipment routes gives China a forward footing. It is said that China is also wary that US may cut off its oil supplies through Malacca straits in case of any increase of hostilities on Taiwan issue. (3) China has however, always denied that Gwadar will ever be used by Chinese military. Publicly they have always called it a civilian port of Pakistan. (1) Gwadar port is also making regional players nervous. Iran which is only 72 km away from Gwadar considers it as an economic threat taking business away from Iranian ports. So in competition to Gwadar, Iran has developed its own port called Chabahar with the help of India. 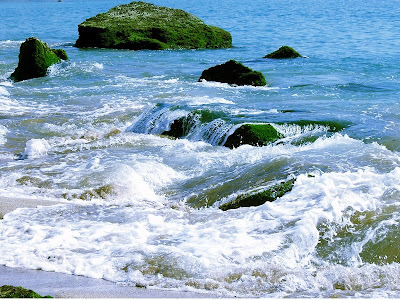 Chabahar is located in Iranian Balochistan province of Seestan. India is also building 213 km long road to connect this Iranian port with Afghanistan. India is eyeing this Iranian port as its own shortest route to Central Asian markets and may be a counter balance to Chinese influence in Gwadar. (2) India may also consider the Chinese influence in Gwadar as a move by China to encircle India, hence their interest in developing Iranian port of Chabahar. (1) Now if you thought that was all, don’t forget the nationalist angle to Gwadar port. Baluchi people in whose province this port has been developed are not 100% behind the project. Their apprehensions are that other provinces will reap the real economic benefits of this development. There is also a resentment against the labour for the port coming from other provinces as well as the real estate boom that Gwadar is seeing is going to people from outside Balochistan. This has resulted in some violence in the area including some attacks even targeted against the Chinese engineers. The attacks against the Chinese also gives rise to the speculation that our friendly neighbours may be inciting Balochi nationalism for their own economic agenda but there has to be some truth that Baluchis deserve more share in their province’s resources.